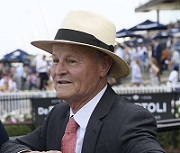 Trainer David Payne says Tarka has always punched a bit above his weight but with a few rivals falling by the wayside he’s emerged as the heavyweight of Saturday’s Group 3 $200,000 360DMG Gloaming Stakes (1800m) at Rosehill. Tarka has taken over the mantle of Payne’s leading hopeful for next month’s Group 1 Spring Champion Stakes with injury sidelining stablemate Toulouse while a cloud hangs over the promising Chris Waller-trained Dealmaker who was conspicuously absent from the Gloaming field. “Unfortunately Toulouse was a bit lame this morning so I pulled the plug on him and he’ll go to the paddock,’’ Payne said. “But every time we’ve stepped Tarka up he’s delivered, he’s been a difficult horse to assess because he has surprised us. Tarka caused a mini-upset when he made it three straight wins in taking out the Group 2 Stan Fox Stakes (1500m) on September 8. In a rough-house affair he was able to navigate through the field and narrowly hold off Dealmaker while The Autumn Sun came off second best from a bumping duel with Tarka and ran third. “It was a solid performance because he had a few bumps as well from (The Autumn Sun),’’ Payne said. “He’s tough and came through it well and happy and he’s on track. Tarka was a $2.60 favourite on Wednesday with TAB in the Gloaming ahead of Irukandji and the Victorian Tavirun ($4.00). Four out of the last six Gloaming winners have taken out the Spring Champion Stakes (2000m), including Payne’s star stayer Ace High last year. Being out of a Galileo mare, the colt will relish the step up in trip and Payne said he could follow Ace High’s path through to the Victoria Derby. Ace High led all the way to win the Gloaming 12 months ago but that’s not something Tarka will be asked to do. “He can either box seat or sit just where he is comfortable but we don’t want to go to the front on him,’’ Payne said. Stablemate Silent Explorer is an $18 chance in the Cabra-Vale Diggers Club Handicap (1300m) on Saturday and Payne said he’s capable of a better performance than his price suggests. The gelding, runner-up to Toulouse at 1400m back in June, was beaten a length when he resumed at Canterbury on September 12 and drops 4kg. “He’ll be competitive, the other day he was a little bit unlucky,’’ Payne said. Meanwhile, Payne confirmed Ace High will contest the Hill Stakes (2000m) on Saturday week but ruled out staying home for The Metropolitan, preferring to stick to the Caulfield Cup plan, despite the scratching of favourite Avilius.